What Do Ruffed Grouse Eat in Spring, Fall, & Winter? Home AdviceGrouse Hunting What Do Ruffed Grouse Eat? What Do Ruffed Grouse Eat? Know These Details To Improve Your Chances Of A Successful Hunt. Spending the time to get to know ruffed grouse well is definitely going to pay dividends during your hunt. In our article about tips for ruffed grouse hunting, one of the main keys to finding good grouse habitat was to figure out what grouse eat & then locate the source of that food. In order to do that, you’re going to figure out exactly what the ruffed grouse eat in your location. Before we dive into the list of what foods ruffed grouse eat, we want to mention that major factors in their diet are going to be the area they live in & the time of year it is. For example, the diet of a ruffed grouse in northern Wisconsin is going to change significantly once the weather gets cold & covered with snow. Basically all we’re trying to say here is that you’ll have to use some common sense when it comes to narrowing down what foods ruffed grouse are eating in the area you’re hunting. Grouse chick’s diet normally consists mainly of insects as they grow, found both on the ground and located in trees. Once fall rolls around ruffed grouse’s diets will begin to shift. The supply of the new buds & berries from the spring will start to dwindle, and they will start to rely on more of the traditional grouse hunting habitat for food. Another major food source at this time of year for ruffed grouse is broken up acorns. This is a major reason why road hunting seems to be so popular. Acorns that fall on roads end up getting smashed as folks drive over them. This makes for a super easy meal for grouse if they can be the first to get to them! So What Do Ruffed Grouse Eat In The Winter Then? Winters are tough on everyone but when you consider how little insulation grouse have it’s pretty impressive that they simple live through it, let alone thrive in it. 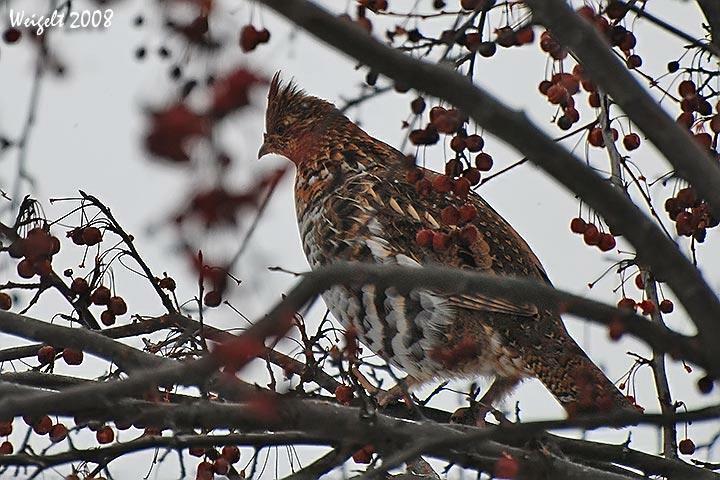 It doesn’t take a genius to figure out that there aren’t going to be many insects & berries around for ruffed grouse to eat during the winter, but pinpointing their food sources can be a little more challenging if you haven’t scouted the area well. It’s during this time that ruffed grouse complete their transition to a diet that pretty much consists solely on the buds and catkins of the same small trees that they eat during the fall. These are the only real sources of food that they have left during this time of year, so if you’re trying to locate them you’ll definitely want to check out areas filled with these trees.